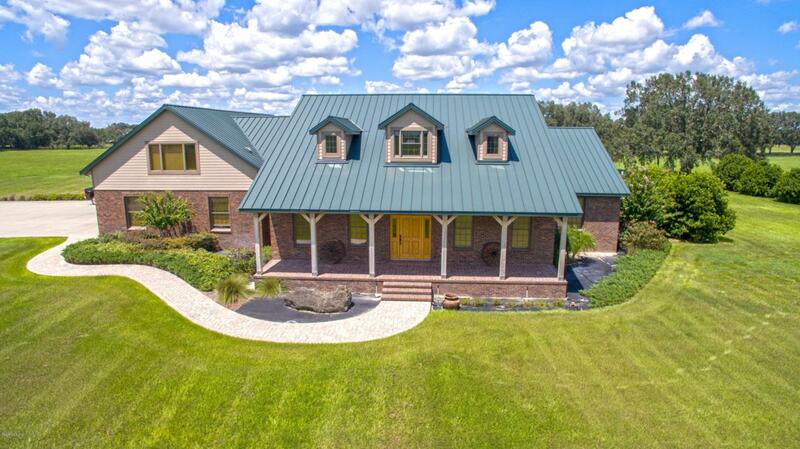 In the middle of Central Florida's Horse Country on 40 beautiful acres is this stunning 6,226 square-foot, five-bedroom and four-bathroom home with a country-style metal roof. Heartwood pine flooring is featured throughout the interior. Chef's kitchen with stainless appliances, expansive granite counters and wrap around conversation bar. Great room features a floor to ceiling stone fireplace and soaring ceilings. Relax in the spacious master retreat that hosts a spa bath with soaking tub, walk in shower and double vanity. Guest suite with office, sitting area and private bath. Adjoining the home is a 13-foot deep saltwater pool with a pool house. Contact us to discover all that this gorgeous property has to offer. Listing provided courtesy of Valerie Dailey of Showcase Properties Of Central Fl. © 2019 Ocala/Marion County MLS. All rights reserved. IDX information is provided exclusively for consumers' personal, non-commercial use and may not be used for any purpose other than to identify prospective properties consumers may be interested in purchasing. Information is deemed reliable but is not guaranteed accurate by the MLS or Realty Executives Mid Florida. Data last updated: 2019-04-24T23:31:44.523.